Unique dungeon and dragon skull theme sword with intricate metal fittings and chain. This item measures 28" overall and features a 420 stainless steel 21" blade with an antique laser rune etch. The cast metal handle is uniquely detailed with writhing serpent bodies accented by red jeweled eyes. Includes a black leather wrapped coordinating scabbard. A good budget piece. Smaller than I expected, me and my lack of a yardstick for reference, but it's still visually impressive, given the price. Overall, it makes a brilliant costume piece, but I wouldn't recommend it for much more than that. It's too dangerous for practice or play, not quite visually impressive enough for a wall hanger, and too clunky for cutting up dummies or slaying dragons. A more realistic rating of this sword would be a 9/10. i'm guessing it was meant to be more of a display model than used to chop stuff up.Pretty much awesome but the blade was kinda dull, coulden't cut the box it came in. For my first sword though it's sweet, and it was delivered the morning after i ordered it. Beautiful blade, not sure if it's long or large enough to count as a 'broad sword' though. I'm not sure about the links at the end of the hilt, but otherwise this is an amazing piece. Came peace tied & looks better than the image shown. I ordered this sword on Friday and it came Sunday. I was amazed by the fast shipment. It will still fresh on my mind and I felt like a child when I saw it on the porch. This was the first sword I bought for movie props. I am very happy with my purchase! I just purchased another! I just got this sword yesterday, and when I took it out of the box, I was speechless. This sword is absolutely beautiful, it looks like something that was pulled straight out of a fantasy universe! The detailing work on it is flawless and it's just an amazing piece of art. I would recommend this to anyone who likes fanatical or evil looking swords, or just appreciates art in their blades. This thing is well worth $25 dollars and even more! For the price you pay its so worth it. love the details in this sword. Its light and sturdy. Everything you could want from a one handed sword is in this sword for sure. -Nothing else I could find! Being 15 I personally LOVE this sword! 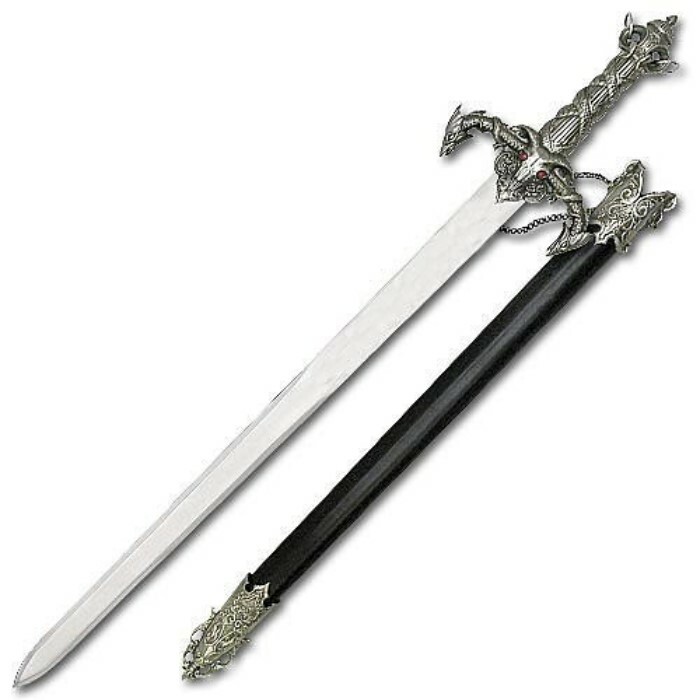 A nice pick for anybody who loves swords, middle ages, or Dungeons and Dragons! Well, it is not exactly a broad sword, more like a short sword and it is a little different looking than the picture, but that really doesn't take away from it at all. Other than that and the fact that it is a bit heavier on the back end, it is a nice sword for the price. A good show piece and has a decent edge and point but I don't think I will be using it for anything else but for display. The dragon motif on the hilt and the etchings on the blade are a nice touch. The leather covered scabbard was also a great addition. It's a quite decorative short sword, it seems pretty sturdy, the blade end is a little heavy compared the the hilt end. The scabbard is covered in a leather like material, and comes with a cord wrapped around it, as well as the chain shown in the picture, the blade is scripted with black markings not shown in the picture, It's a nice display piece, for a fair price.